Welcome to the Pink Palace! Built in the early 1900s, our Victorian style house is home to 18 of our chapter members! Our home is located at the top of Higuera street, just a short walk from San Luis Obispo's charming Downtown area. When we aren't swimming in the pool, or enjoying SLO's lovely sunshine, you can find us indoors using our newly remodeled kitchen, or down the block perusing the shops. Our entire house was recently renovated, and has been featured in the Mustang Daily, Gamma Phi Beta's magazine The Crescent, and the SLO Tribune. 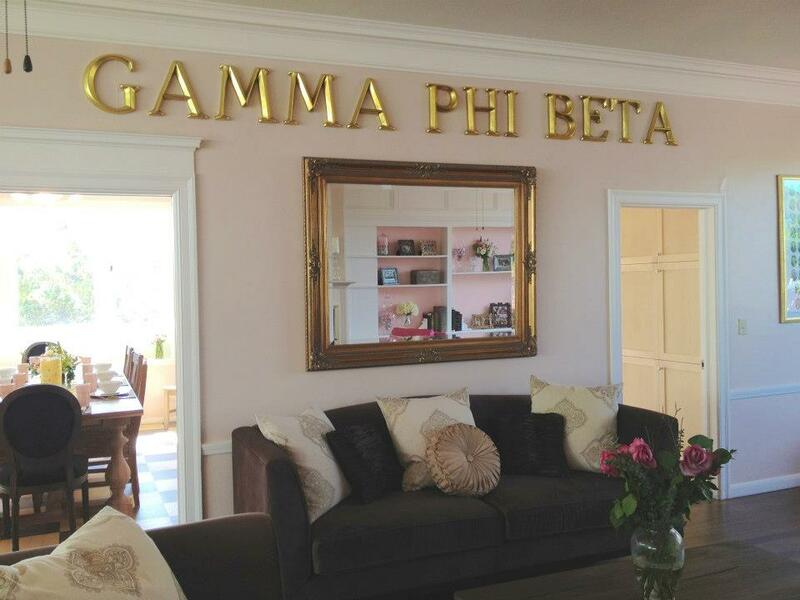 The ladies of Gamma Phi Beta have called 1326 Higuera Street our home since the 1970s when it first donned its pink sheen and received it's own set of letters. Although the Pink Palace only sleeps 18, it is home to more than 200 women, and is full of the happiness and memories that have been made inside its walls. Whether you received your bid a week ago, or you have been a part of the sisterhood for 50 years, the Gamma Phi Beta house is always open to its members as a home away from home. The 18 residents share among them 6 bedrooms, 4 bathrooms, 2 living areas, a large kitchen, and a detached study room. The house is always bustling with sisters sharing meals, studying for classes, crafting for littles, or having movie nights. Members of all ages are encouraged to apply to live in the house, for it is a wonderful opportunity for members in all grades. Living in your dinners are provided for you Sunday through Thursday, and our House Manager does all the grocery shopping for you! If that isn't enough, our house is registered as a San Luis Obispo Historical Landmark, and is the only Sorority house at Cal Poly that has a pool! Each and every member values the Gamma Phi house for different reasons, but we hope that it gives you that special something that you were looking for.